So-called “anti-terror operations” in Mariupol today have seen a number of deaths as Ukrainian military and “National Guard” (an outfit including many virtually untrained neo-fascists) face off against crowds of unarmed protestors. The BBC covered this situation and, whilst admitting the Ukrainian army is killing unarmed civilians, have edited a video to cut out the part where the Ukrainian army shoots a cameraman, injuring him severely and at a man who is on his knees with his hands in the air. 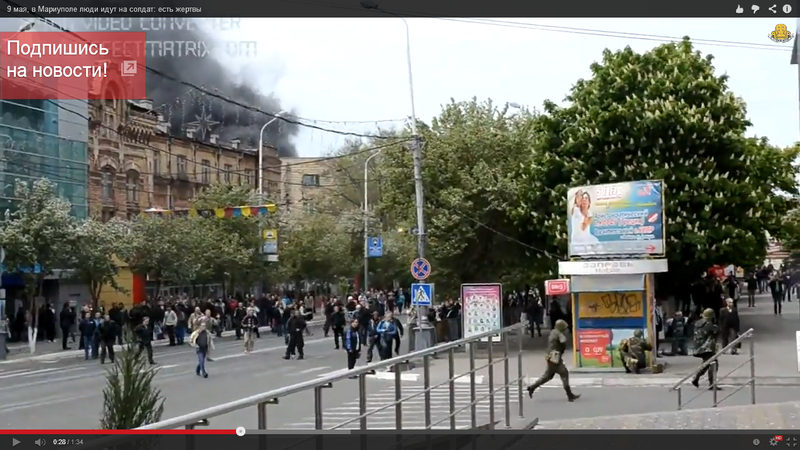 During the incident in question, Ukrainian APCs drive past, shooting one man who tries to get in the way. Ukrainian infantry are then seen trying to cross a road, in the face of a hostile crowd of locals who are accusing them of being fascists. One man maintains a position on the corner providing cover as his unit run across the road one by one. It seems highly unlikely he considers there is a massive risk from the crowd or he would be sheltering on the other side of the building. As the last infantryman crosses the road, one of the soldiers, who is covering the retreat, appears to fire four shots. The first hits the road, whilst further shots appear to injure a man in a suit in the leg and a man who has been kneeling on the ground very close to the shooter remonstrating. The fourth shot hits a cameraman (wearing blue). Seeing the three men apparently being shot, the crowd extremely bravely (a consistent feature of clashes in Eastern Ukraine) surges forward and a man can be seen firing two pistol shots towards the soldiers. At least two more civilians are then shot by the soldiers, a man in a blue vest as he appears to be trying to throw a chair towards them. One man, wearing a black top and blue jeans, receives what is almost certainly a fatal head wound as he comes out of the tent with a chair. Clearly, what we are seeing unfolding is a war crime, as it is impermissible to use deadly force against civilians in this way. It appears that a stringer for Ruptly was amongst the victims, and we wish him a full recovery. We do not know who the man with the pistol is. We do know that some policemen including the Head of Mariupol’s traffic police were killed by the Ukrainian army during today’s events. It is sad that someone should seek to distort the facts of this incident in order to produce propaganda, but that is what Gabriel Gatehouse ( @ggatehouse ) and the BBC Newsnight team seem to have decided to do. They have shown part of the first video below, (This can be seen on iPLayer from 3:56) cutting out the early part and failing to give the context. The part they have cut out is the part which shows the cameraman, the kneeling man with his hands up and the man in the suit being shot at close range – their version of the clip begins with the man, wo they describe as “pro-Russian” (rather than, for instance, “anti-Fascist” or “Federalist” or perhaps most accurately “local inhabitants”) shooting the pistol. By cutting out the prior footage of unarmed civilians, including a cameraman and a man on his knees being shot at, Gatehouse gives the impression this is an unprovoked act by the gunman, rather than either an act of retaliation or an attempt to defend the crowd. Gatehouse continues, “A moment later another shot rings out, and a man falls to the ground.” Gatehouse doesn’t point out that this man is another unarmed civilian, shot by the Ukrainian army, or that another man was shot shortly after him in a similar way. Gabriel Gatehouse has as yet failed to explain why the BBC edited the video in the way it did, but it is now the subject of a complaint. Updates based on final video above. The man kneeling does not appear to be seriously injured as he is later seen helping the man in the blue vest. The Ruptly stringer is no longer in critical condition. The man with the (almost certainly fatal) head wound is not the man with the pistol. BBC has no journalistic ethics and will be held to account for their aid and comfort to the rogue nazi junta in Kiev; having turned from watchdog to lapdog. We can see that YouTube has removed one of the videos. I don’t know of the person who posted has a backup – but I hope so. Yes, the problem is that western media has a hard time explaining why civilians are being shot like this. This game of supporting neo-Nazis in Kiev is now harder to play, especially when justified by getting at “Putin” (Russia personified as Putin), and its obvious some people have committed crimes against civilians. It’s almost fascinating but equally raising a sick feeling in the throat. Brown Moses aka Eliot Higgins is working at 110% overdrive to spin this story into innocent soldiers attacked by armed protestors and simply defending themselves. Precisely who is paying him? ?